Favorite female vocalists? What a riot! I wish I could have them all here. But here are three of them who sing lyrics that are quite relevant to me these days. What if... Charlie Sheen were right about who he is, what he is saying and his "goddesses"? Then Howard Stern's assessment would be confirmed. Charlie is special. What if... Potato chips were declared a vegetable? What if...All the junk going on in parts of the world ended in peace? What if...gas prices hit $5? What if...American Idol got canceled? What if...the Queen of Alaska was elected president? What if...talking on a cell phone while driving became illegal? What if...Bud and Kathy invited you to a party- would you go? What if...you found $1000 sitting in the road? You've got the greatest female picks here! Nicely done! 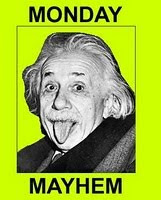 I loved your Mayhem Monday answers. They made me chuckle. Thanks for the laugh. LOL, Charlie is indeed special. In the 'not a good way' variety. Have a wonderful week! Potato chips are not a vegetable? Darn! I loved Dionne Warwick when I was little, such a great voice! Heartbreaker was my other favorite of hers! I really like Gloria too! Coming out of the dark was one of my fav Gloria songs! Nice picks! Loved your Queen of Alaska answer. Very well said. I enjoyed all three of your female choices... you are the winner..."Winning.." just like Charlie... "Winning" I think that is going to replace "Whatever" "Winning"
hahaha How inventive! Your Post is wonderful and your choices superb! Thanks for playing along with us today & we definitely hope to see you next week. Love these ladies! I have not heard Dionne Warwick in such a long time! Glad you joined with us today. Aren't those just the best! these are all songs I grew up on Hazel. I like a lot of the new stuff out there but the music from our era rocks! Are you in love Hazel ??? The Rumford is a much more efficient way to heat a room than earlier fireplaces....(Wikipedia on Benjamin Thompson, Count Rumford, designer of tall, shallow fireplaces which are now known as the Rumford, was an Anglo-American physicist known for his investigations of heat)Living in the tropics, I have been in close proximity with only three fireplaces in my life. There was an unused one in the home of my college professor in the Philippines. The other one from which I could feel the heat and see the fire dancing was in a hotel lobby in the Yorkshire Moors. Picture taking was quick. Two old ladies were having tea by it, but that was my first ever real fireplace experience, and I loved it. The latest I have touched is the one in Jane Austen's imaginary Northanger Abbey. These are words that begin with Q and not followed by U; in random order. Is there anything that's not new to you or have you used some in speech, writing, or word games? More here and on crosswordsolver. In 1811 Thomas Egerton of Whitehall, London published Sense and Sensibility. Quick math shows it has been two centuries since Jane Austen became a full-fledged author. Quite an anniversary, indeed. A celebration, I declare. Blogs regarding the publication anniversary of this romance novel picture Jane Austen's engagements whilst making the final touches of her manuscript from Sloane Street. In letters to her sister Cassandra, Jane gave accounts of her shopping for muslin, the party that their brother Henry and SIL Eliza gave; mentioned several acquaintances, and referred to her book as S and S.
As a fan I wonder which between sense and sensibility did JA deem more important since she portrayed both attributes equally well. I'm obliged to enthuse over my S & S reading experience. Alas, I only managed fourteen chapters before getting sidetracked by another novel, the very first that JA wrote. I will resume and complete my affair with the celebrant before 2011 ends.